The Jim Hackett "interim" era is officially coming to a close. On Wednesday morning University of Michigan President Mark Schlissel announced that Michigan will launch a national search for a new Athletic Director, immediately. Jim Hackett took over at Athletic Director after Dave Brandon resigned last year in October. 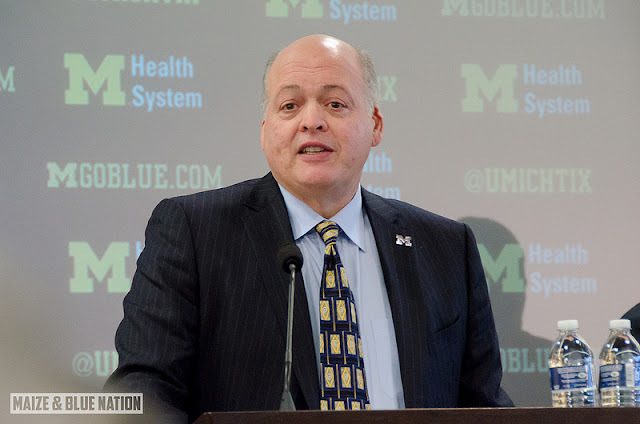 According to Brenden F. Quinn of MLive, Schlissel said in a press release that Hackett does not wish to be considered for the permanent AD role. However, Hackett agreed to be a part of the search advisory committee and will remain in the role until a permanent replacement is hired. Also according to Quinn, Michigan has hired Turnkey Search to help out in the search for a new Athletic Director. They will pay Turnkey $150,000 plus expenses. Hackett has done some great things since taking over on an interim basis. He fired Brady Hoke, hired Jim Harbaugh, and brought Nike back as the sponsor for Michigan Athletics. The next Athletic Director will be only the 12th Athletic Director at the University of Michigan.